In the late 1950s I was involved in the Boy Scouts program on the northwest side of Chicago. Being an avid paddler addicted to exploring the area's waterways, I wanted to share my passion with the young men in the program. I started out by teaching them to build canoes and kayaks with canvas over a frame construction, but I soon discovered fiberglass and polyester resin, which I could build a craft that was less prone to damage than the canvas ones. This led to the development of a fiberglass mold modeled after a 16 foot Old Town Guide. This model became the key to a kit program, allowing many Boy Scout troops and individuals to build their own canoes. In the meantime, I was guiding Scout troops and their new canoes on exploratory canoe trips in our area, showing them how they could add an affordable note of adventure to their programs. Attendance on these trips exceeded 100 at times. Before I knew it, there were over 500 of my little canoes made. One day, I had an idea, another way all these canoes could be used by the Boy Scouts was a bit of fun competition, a canoe race. The Des Plaines River was close by, and was relatively protected by the Cook County Forest Preserve system. However, one of the prettiest stretches of the river, in Lake County there was no such protection. Perhaps starting the canoe race in Lake County could educate people on the value of this resource before developers ruined it all? Access was a difficult because all the bridges were two lanes roads with no shoulders and heavy traffic except one, Oak Spring Road in Libertyville. This two lane secondary road had an unused gravel pit on the west side of the river and the river made a loop through the gravel pit area, forming a large pool ideal for lining up ten or more craft on a starting line. The finish line was another matter. There was no area large enough for the kind of crowd with parking spaces needed for the activity until the Dam #1 picnic grove near Wheeling. Unfortunately, that area was usually crowded with families picnicking. We discovered that just downstream the Dam #2 grove in Mt. Prospect was seldom used, had a large parking area, and most importantly, had a high bank allowing the finish line judges to see a quarter mile upstream to watch the contestants approach the end of the course. It was ideal and at the time, I estimated the distance at approximately 25 miles. I hit on the idea of calling it a “marathon”. And so, the annual Des Plaines River Canoe Marathon was started. And not without many mistakes! The first race was held in the autumn during low water. 25 craft made the challenging run. Then I decided to move the date to the Sunday before the Memorial Day weekend, a time when the river was more apt to be full of water, and the trees and flowers would be in spring bloom. That has been the traditional date each year, except last year, when the date was accidentally set one week ahead of schedule. In the second year 106 craft entered the race, followed by 156 the third year, and 206 the fourth year. The Marathon's popularity was established. In scouting, the awarding of participation patches, small colorful Swiss embroidery designs on a cloth backing, are important recognition to the Scouts as well as to the leaders. Trophies were planned for the winners in each category, but it was felt that anyone making the long journey all the way to the finish line should have their efforts recognized also. It was important that the year of participation was also noted. So another tradition was born. Because the Des Plaines River had been a route of the voyageur in years past, I asked a friend to sculpt a clay figure of a voyageur to use as a trophy. After trying rather unsuccessfully to reproduce the sculpture in resin, I invested in a bronze mold so the figures could be cast in a zinc metal. These were then plated with various finishes and have remained the first place awards ever since. For thirty years I was the chairman of the event, together with some very talented individuals. I traditionally assembled the trophies myself each year, usually on the Saturday evening before the race day. The timing was very simple in the early days of the race when participation was low. Peter Brohl, a time study man and a scouter volunteered to be our timer. We eventually worked out a system with a 3x5 card for every entry, colored coded for the division they were in. The starting time was written down for each entry and later, the finish time. The elapsed time was computed and the cards were placed in chronological order with the shortest times, the winners, in front. The process was simple, but not without it's opportunities for error. Even when computers were introduced years ago, errors crept in until the system was improved to what it is now. Today our timekeeping process has been improved to provide the most accurate timekeeping possible. Early in the game, one of our co-chairman was also involved with the various civilian defense groups in the area and got them involved as a safety committee. This allowed them to practice their radio communication skills as they set up coverage from the start at Oak Spring Road to the finish at Dam #2 as well as provide our competition with the necessary safety personnel. Many have been faithful volunteers for many, many years. As participation grew, it was decided to limit the entries to 1,000 watercraft and we often came close to filling that number. It is not that the river could not handle more than that, it was the numbers of automobiles in the area that strained the resources. It is interesting to note that during the height of the race, usually no more than several teams are in sight at any one place along the river. They are strung out after leaving the starting line and the winding wooded course screens them from view. Imagine taking that many participants on a hike through those same woods, trampling down the vegetation in the process. The Marathon illustrates that the river is the only trail through nature that leaves little trace of your passing. Three years after the Marathon began, Bob White, outdoor writer for the Aurora Beacon News, wanted to start a similar event on the Fox River. The Mid America Canoe Race was born. The Mid America is sponsored and run by the Fox Valley Park District. The Annual Des Plaines River Canoe Marathon is still being run by paddlers, for paddlers. It's encouraging to know that the river in Lake County is now eighty percent owned by the Lake County Forest Preserve District. The Des Plaines River Association was formed with the mission of conducting the annual race once a year and furthering the protection and restoration of the Des Plaines River. We're pleased that this effort is still alive and well after 43 years. In Memoriam Following an illness which tempered, but by no means diminished his enthusiasm for life in general and canoeing in particular, Marathon founder Ralph Frese died early December 10, 2012. 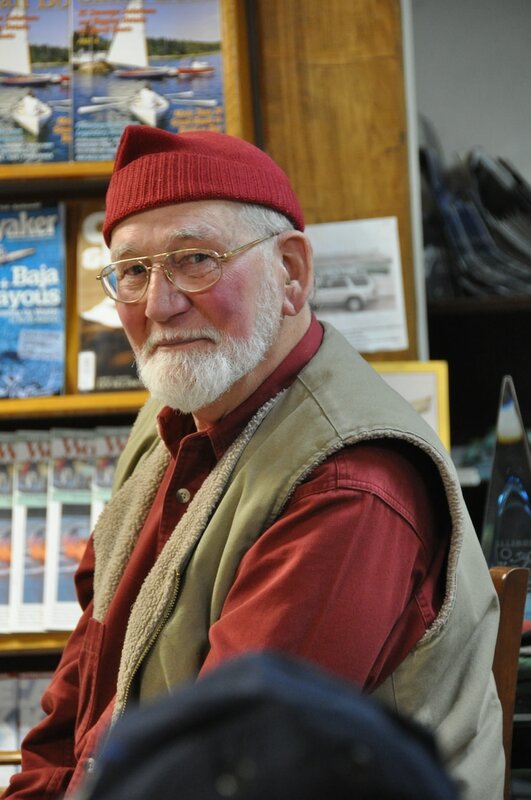 Of course, the annual Marathon was but one of many contributions of Ralph to fostering a quest for outdoor adventure, athletic competition, Voyageur history, canoe design and construction, metalworking and environmental responsibility in his 86 years with us. We are grateful for these contributions and in particular for his ability to attract, inspire and enthuse an ever-growing cadre of like-minded supporters, of both professional and amateur backgrounds, to follow in his footsteps. We appreciate the many leadership roles which he has played in our lives!